In this unit you will learn more fretted notes on the second string, more navigation symbols and tone colors. 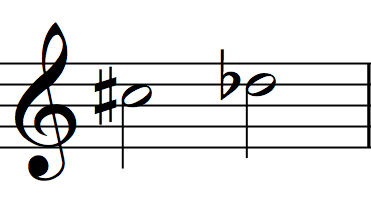 ‘C♯’ and ‘D♭’ are enharmonics. To play ‘C♯’ and ‘D♭’, fret the second fret on the second string. 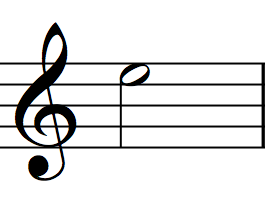 ‘D♯’ and ‘E♭’ are enharmonics. To play ‘D♯’ and ‘E♭’, fret the fourth fret on the second string. You already learned to read this note as the open first string. However, this same pitch can be played as the fifth fret of the second string as well. The following symbols and Italian phrases direct you to repeat sections of music, often by jumping backward and forward in the score. Centuries ago, when paper was far more expensive than it is now, these symbols were cost effective. These symbols are still used today because musicians prefer to play from scores with minimal pages. The Coda looks like an ellipse covered by a cross. It means “tail” in Italian. 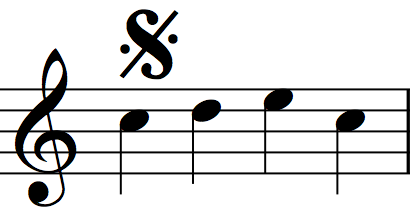 The Coda marks the starting point of the composition’s last section. The Segno looks like an upper case “S” bisected by a diagonal line and dots. It means “sign” in Italian. Placed within the piece (not the beginning or ending), it marks a section to be repeated at a later point in the piece’s progression. D.S. is the abbreviation of Dal Segno. It means “to the sign” in Italian. The phrase directs you to go back to the Segno symbol. D.C. is the abbreviation of Da Capo. It means “to the head” in Italian. The phrase directs you to go back to the beginning of the piece. The Fine is written directly into the score. It means “the end” in Italian. It marks the end of the piece. Navigation symbols allow you to jump around a score. Occasionally, a piece will end somewhere in the middle of the score. The D.C. al Fine directs you to go back to the beginning of the piece and play until the Fine. The D.S. al Fine directs you to jump to the Segno and play until the Fine. The D.S. al Coda directs you to jump to the Segno, play to the Coda, jump forward to the other Coda, and play to the end of the piece. 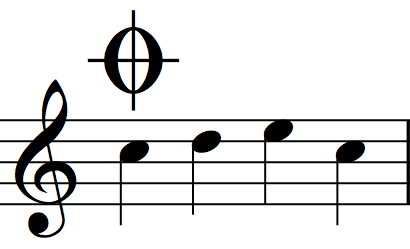 In this case, two Coda symbols (or words) will be placed in the score. Tone colors are usually written in italics. Three tone colors are commonly used in guitar music notation. This phrase, which means “at the neck” in Italian, directs you to either pluck near the neck (for acoustic guitar) or engage the neck pick-up (for electric guitar) to produce a warm color. This phrase, which means “at the bridge” in Italian, directs you to either pluck near the bridge (for acoustic guitar) or engage the bridge pick-up (for electric guitar) to produce a bright color. Ord. or Norm. or Nat. 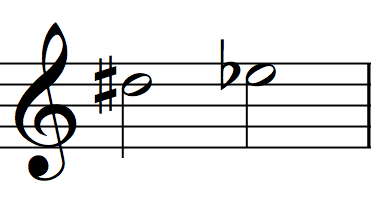 The words ordinary, normal and natural often appear as abbreviations, which direct you to cancel the non-standard technique that preceded it in the score. In the case of guitar, the ordinary way of playing involves plucking over the sound hole (for acoustic guitar) or engaging both pick-ups (for electric guitar) to produce a full and even tone. Many pieces contain repeated musical material. When you scan the piece prior to sight-reading, practice jumping your eyes from one section to another, according to the directions of the navigation symbols. Great sight-readers train their eyes to scan and jump around the score with rhythmic precision. Sight-reading forces us to react to information quickly and trust our instincts. The next piece contains many repeated sections and a D.C. al Fine. When you reach the D.C. al Fine and go back to the top of the piece, play the music within the repeat bars only once. This is standard practice.